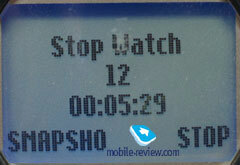 Motorola is well-known for its low-end solutions with acceptable functionality, good quality and very low price. 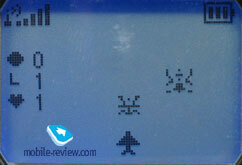 The new model Motorola C 115 did not become an exception. Here we will talk about it; it differs from its analogue - C116 only in the design, but their functions are similar. The company has realized the simple idea in the C115 – the phone must call, work as long as possible, have only the most necessary functions and be comfortable. This model has the Li-Ion battery; its capacity is 920 mAh. 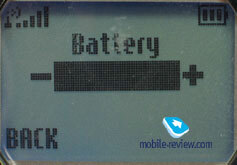 It is the maximum capacity of the battery in the contemporary phones by Motorola, and it is especially strange to see it in the low-end model. According to the manufacturer it is capable of providing up to 3,5 hours in the talking mode and up to 200 hours in the stand by mode. 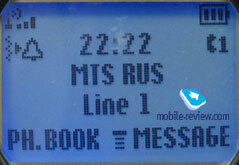 In case of Moscow MTS network the phone has worked 5-6 days in case of 40-50 minutes of talk and minimal using other functions. The time of the full charge of the phone is little bit more than 2 hours. 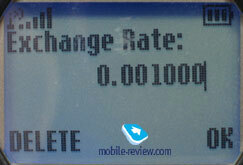 Due to black-and-white display with the blue backlight it became possible to reach such low power consumption. 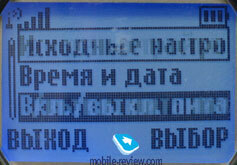 The resolution of the display is 96х64 pixels that allows showing up to 4 text lines and one information bar. In contrast to the models with the color displays, here you will not have any problems with reading the information in the sunnu day. Let's return to the design of the phone. 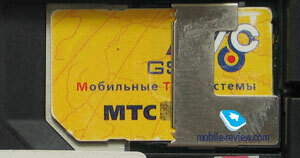 The handset is of the small size, you may put it in a pocket of jeans or shirt. Its weight is also light. It looks nice and it remains the reduced and ennobled copy of the low-end solution by Siemens. Taking into account, that the basic competitors of this model are phones by Siemens, such similarity does not seem to be casual. Two color solutions are supposed to be available - red and black (ash-black, trans red). The phone looks rather spectacular; you cannot imagine it as the cheapest model. 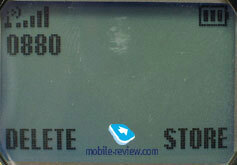 The keypad is executed of rubber, buttons are hardly less than of the average sized and they are located well. 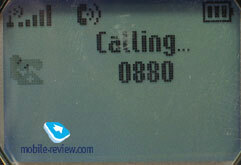 It is comfortable to type messages and dial number, there are no any problems. The backlight of the keypad is dark blue. 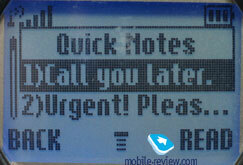 Despite of a small font on the buttons they are visible well in various conditions. There are no side keys in this phone; you can see only the charger connector and a microphone at the bottom. At the top there is a strap hole. As you can see, everything is rather ascetic as it is the low-end model. If you compress the phone in your hands, it will start to squeak. The appearance of the extraneous sounds is probably only in case of typing the text and strong compression of a back cover. Its insignificant clearance will not be visible and, especially, heard for the majority of users. 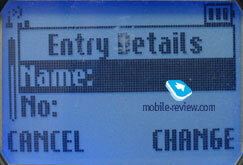 Pressing the left soft key you can go to the Phonebook and the right button gives the quick start to "Messages". 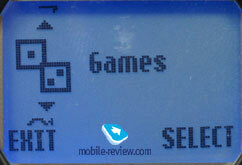 The items of the main menu are arranged in the circular order: you see the title of the item on the right side of the screen and the animated icon on the left side. The phone supports shortcuts number navigation. The Russian input is incarnated everywhere where it is possible. 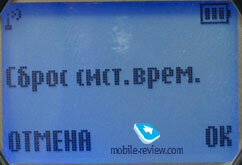 In the Russian version of the model Cyrillic symbols will be written on the buttons. Let's discuss different functions. Phonebook. It is possible to keep about 100 names, you can include one number only for each name (but, according to the tradition of this manufacturer, you should not type the name of the same subscriber twice, it is enough to use the function "add number"). 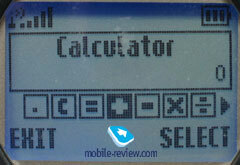 Numbers both from the memory of the phone and from a SIM-card are simultaneously displayed in the general list. On the display you can see the number as well as the name. There is a quick search of the number by the first letter. Messages. 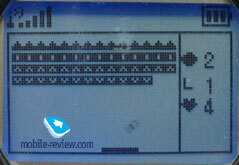 There are 10 changeable templates in the phone. 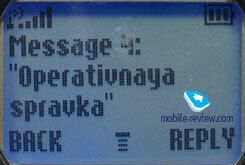 Concatenated messages are also supported (765 symbols). Call list. 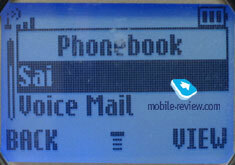 Here you can overlook last lists of the received and dialed calls. There are up to 10 records in each list including the indication of date and time. Rings. 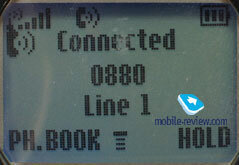 In this submenu the user can find all settings connected with rings, there is not anything outstanding. Phone settings. Security settings, language settings and others are collected here. Games. 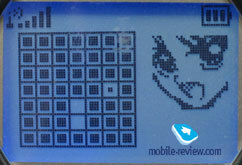 There are three games in the phone – Chess (it is not the real chess but a logic game), Small Bee (arcade), Spring Ball (brick game). My menu. 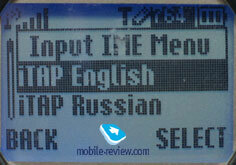 Here you can adjust the labels for the most frequently used functions. 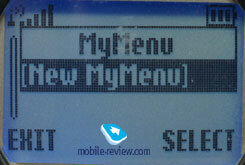 Considering the large branching of the menu, this function is very useful. Alarm clock. 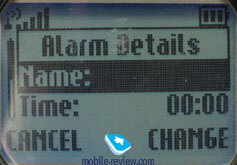 It is possible to set the alarm clock on the certain time, but repetitions or some other functions are not present. Extras. Everything is quite ordinary here: there are stopwatch, timer, calculator, unit converter. Being the low-end solution, С115 offers quite good reception quality, verified (you should read it as minimal) functionality. There is nothing supernatural in the phone, but its price, which is about 70 dollars, bribes you. The long working time after the recharge is the advantage of this phone. Rings are not polyphonic but they are loud enough to hear them in any conditions. The power of the vibrating alert is hardly more than average. As a whole it is possible to tell, that the model is nice and will occupy one of the strongest positions in its segment. Other manufacturers do not have low-end models with the similar specificatons and such low price at this moment.